The fourth edition of Dubai Design Week took place on 12th to 17th November 2018 –as the region’s leading design event produced a lot of Instagrammable moments. The Design District (d3) was overrun with creatives, cool fashionistas and a community of savvy Instagrammers –hence the abundance of pictures snapped throughout the event. Bringing together creative talent from around the globe, Dubai Design Week established Dubai as a creative capital of the region once more. From installations to innovative designs, there was plenty to explore and capture, especially at the Downtown Design fair. In particular, Marc Ange’s ‘Le Refuge’ proved a hit. Located on d3’s waterfront terrace, the installation was presented by Parisian creative house LJ Edition and featured metal palms that were placed against a backdrop of Dubai’s scenic skyline. Also proving popular was Preciosa’s ‘Breath of Light’ installation. 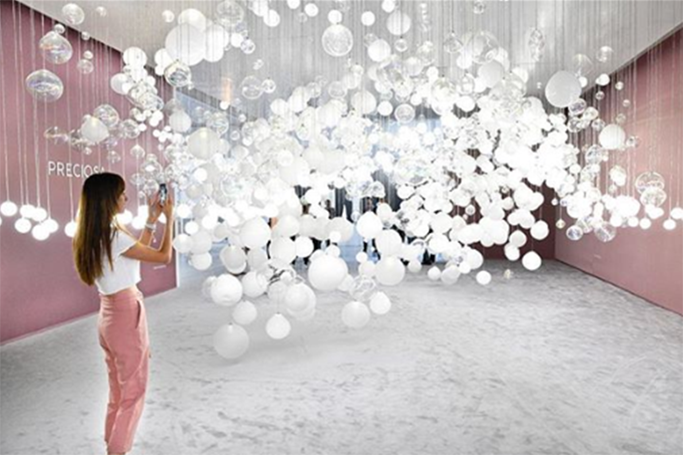 The stunning, interactive piece comprised of hundreds of dream-like bubbles –making it the Instagram centrepiece of the fair!